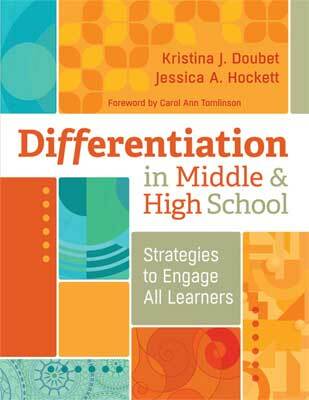 In this one-stop resource for middle and high school teachers, Kristina J. Doubet and Jessica A. Hockett explore how to use differentiated instruction to help students be more successful learners—regardless of background, native language, learning style, motivation, or school savvy. Create a healthy classroom community in which students' unique qualities and needs are as important as the ones they have in common. Translate curriculum into manageable and meaningful learning goals that are fit to be differentiated. Use pre-assessment and formative assessment to uncover students' learning needs and tailor tasks accordingly. Present students with avenues to take in, process, and produce knowledge that appeal to their varied interests and learning profiles. Navigate roadblocks to implementing differentiation. Each chapter provides a plethora of practical tools, templates, and strategies for a variety of subject areas developed by and for real teachers. Whether you’re new to differentiated instruction or looking to expand your repertoire of differentiated instruction strategies, Differentiation in Middle and High School will show you classroom-tested ways to better engage students and help them succeed every day. Kristina J. Doubet is a professor in the College of Education at James Madison University in Harrisonburg, Virginia, where she has received the Distinguished Teacher Award, the Madison Scholar Award, and the Sarah Miller Luck Endowed Professorship for Excellence in Education. Jessica A. Hockett has been a full-time education consultant for 12 years, specializing in interactive and differentiated instruction, standards-aligned curriculum and performance task design, classroom grouping practices, and program evaluation.